Jack: Was it selfdefence when you didn’t talk with the press yesterday? Max: I wasn’t into it at that time. Jack: How long did you stay at the circuit? Max: Half an hour. First I deliberated with my engineers about my car and balance in the race and then I left. Frank: Did you also thought that you first had to have a good night sleep before you could give a reaction? Max: That seemed the right thing to do, yes. Jack: How frustrating is it when your material doesn’t work? 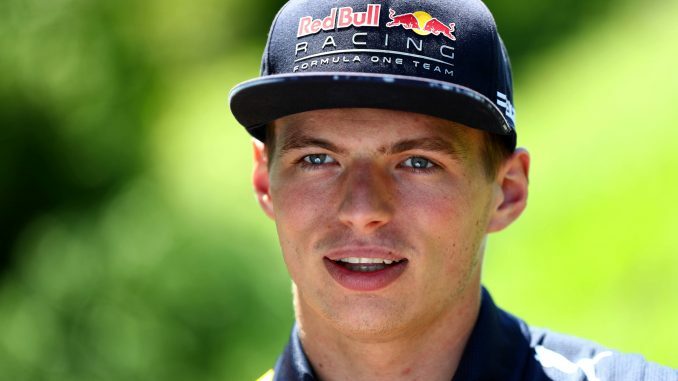 Max: During the race I didn’t even thought about it, but then there is a problem again. And that was very frustrating, because I was in a good position and especially if you see afterwards what all had happened . Jack: What was precisely the problem? Max: They are investigating that at this time. Jack: What do you think yourself? Do you have any clue? Max: By all means something with the engine. Jack: Every time there is something with the engine. Max: Yes, correct. Saturday even so. During qualification I had to turn the engine down, as only renault engine. That was a bit weird. A pitty, but yeah. Frank: Is there an explanation that especially your engine failed? Max: It seems so. I think this engine is done anyway. So we can put a new one in the car. Jack: You have a question Olav? Olav: Max isn’t it time that your team builds you a complete new car. So that everything is new. In the past there are examples that that could be a solution. Or isn’t that neccesary? Max: There is going to be a new engine in it anyway. Max: I don’t think that there isn’t anything wrong with. The speed is good, right? Jack: Speed is great. The different cars keep getting closer to each other. Max: We were positively surprised.. The car is getting forward. But now I want to score some points. Max: I was frustrated allready and when I saw the outcome I could place myself in that picture. Jack: Did party with your team or couldn’t you bring yourself to that. Max: (grin) What do you thin yourself? Jack: (laughs) Ricciardo is either way your buddy, you’re toghether in one team and there is a party. Did you exclude yourself totally and did you left baku fast? Max: Yes, at nine was my flight. Jack: There is speculations. Especcialy because formula 1 becomes more popular. What you’re hearing a lot is conspiracy theory. Jack: Don’t you ever think that? Max: No absolutely not. If you see the guys and the engineers they are gutted also. They work day and night on that car and are evenly gutted when I don’t finish. Jack: Many people also ask doesn’t he ask to much of his car. Is he going over the limit of the car? Maybe Ricciardo is just below the limit. Max: I’m curious what I am doing wrong in that case. Jack: Isn’t that scenario possible? Don’t you ask yourself that question? Jack: Ricciardo is the man at this time. Are you worried for the next race? Max: Yes absolutely. Especcialy because my pace is good right now, but it doesn’t translate in scoring points. Jack: You must be enormously gutted right now. Max: Yes. They expect me to do my best. I expect also from Red Bull and the engine that everything is optimal. Jack: But if you could point anything, then it is at the engine? Jack: and not the first time. Max: I’m sorry to say yes. Jack: I wish you good luck. Do you have a couple of days rest in Monaco. Can you relaxe a bit? Max: I did that today. Wednesday I have to do the simulator. That engine doesn’t break down anyway.